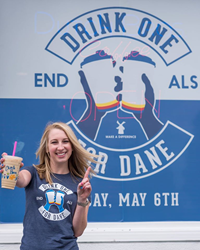 Dutch Bros' annual Drink One for Dane event is on Friday, May 6. On this day, proceeds from all 262 locations will benefit MDA as they continue to research a cause and a cure for ALS. Let's make the largest impact yet for Drink One for Dane. Together, we can make a difference to end ALS. Dutch Bros’ annual Drink One for Dane Day is Friday, May 6. On this day, all Dutch Bros locations will donate proceeds from the day’s sales to the Muscular Dystrophy Association, MDA. Over the past nine years, Dutch Bros has joined forces with their communities to donate over $1.7 million to MDA to benefit Amyotrophic Lateral Sclerosis, ALS, research and family services, donating $506,000 just last year. May 6 will celebrate 10 years of partnering with MDA in hopes of finding a cause and a cure for ALS, a disease that impacts so many lives. ALS is a disease that affects the parts of the nervous system that control muscle movement. There is currently no cure for ALS, and the disease is fatal - most people who are diagnosed will typically lose their battle within three to five years. Drink One for Dane day will forever hold a special place in the Dutch Bros world – as we lost one of the company’s co-founders, Dane Boersma, in 2009 because of this incurable disease. Dutch Bros will continue to honor the legacy of a man who was known to inspire and love everyone around him, and to fight until there is a cure. ALS is a disease that touches the lives of many in Dutch Bros and their communities. All 262 locations in seven states will donate proceeds from May 6 to support family, friends, co-workers and neighbors who are or have been affected by this disease. Together, we can make a difference to end ALS.